Pre-heat oven to 350 degrees. Spray a hot pan and place into oven to heat up. In a large bowl, crack the eggs and mix. In another bowl, add the water and sugar. Mix. Combine the eggs with the water and sugar mixture. Mix. It's been a while since I last updated this web site. I'm in the middle of making changes so please pardon the mess while you are here! Leave me a message if you have any comments. Add the apple cider, water, salt, chicken powder, palm sugar, brown sugar, lemon grass and orange slices to a large bucket. Dunk the turkey until submerged. Cover with lid and let brine overnight 12-24 hours. Use a spoon and gently lift the skin off the meat. You can also use your hands. Spread butter under the skin. Stuff the turkey with the veggies. Tie the turkey ends, fold the wings under. Add veggies and water to the roasting pan. Bake turkey covered with aluminum foil for one hour, then remove foil. Bake turkey until the breast temperature is 165 degrees. Baste turkey with pan drippings. Last 15 minutes, brush with honey. 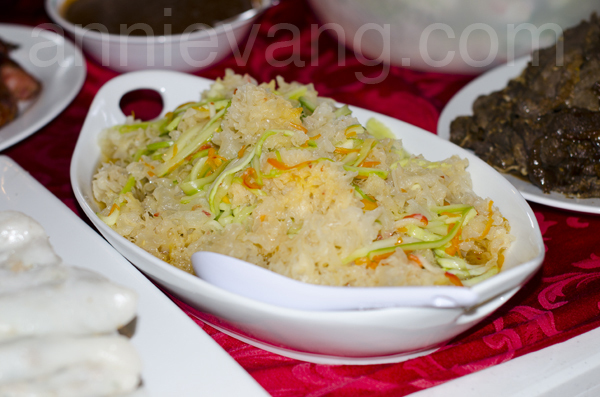 This is a super easy recipe to make Hmong Nab Vam strings (pronounced as na va), also known as tapioca worms. 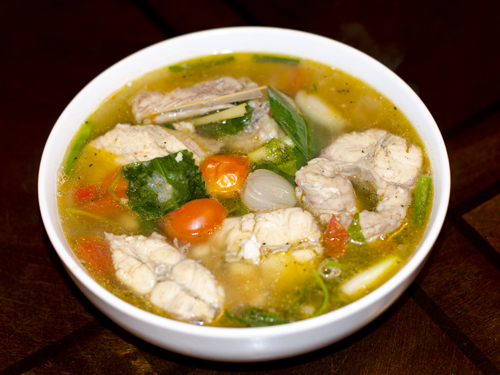 My fellow sister in Christ, Nam Phoumee, taught me how to make this recipe! Thank you Nam Phoumee!!!!! Mix the flour and the 9 cups of cold water in a pot. Stir until disolved. It will resemble white milk. Add the food coloring of your choice. I prefer to use the powder food color cos it makes the color brighter. Place the pot on the stove and cook on high heat and stir. Watch the pot closely and stir continously. Within 3-5 minutes the mixture will start to thicken. Then in the last few stages it will get really thick within a few seconds!!!! This is why it is important to use a big strong spoon. Keep stirring! When the mixture starts to develop big bubbles and get shiny, turn off the stove. Stack the steamer pot in the sink. Pour the hot mixture into the steamer. Using the big spoon with a downward pressing stroking motion, press the mixture down through the holes. The tiny strings will fall into the bottom steamer. The technique to this is to press downward and stroke it to the side. Update!!! -- I recently bought a potato ricer to try to make my worms and they turned out beautifully! You should try it out. You can buy it at Bed, Bath, and Beyond. If you have any questions, please leave me a comment! The key to this is continuous stirring! 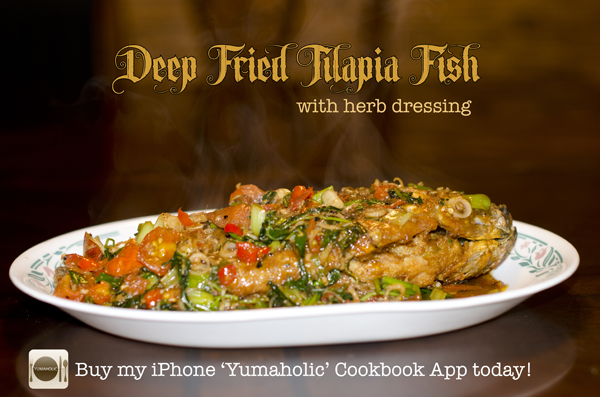 Here is my recipe how to make deep fried tilapia! You can adapt this recipe with any fish. Clean the tilapia fish and cut off the fins with a scissor or knife. Score the fish on both sides. In a small bowl, beat eggs and coat the tilapia in it. Coat the tilapia with flour on all sides. heat a pan over high heat. Ad enough oil to deep fry the fish until golden brown. Flip on each side until golden brown and to ensure the fish cooks evenly. When the fish is crispy on both sides, remove it from the oil and place onto a plate. In a smaller pot, make the sauce by adding 4 tbsp of oil, ginger, garlic, lemongrass, oyster sauce, salt, tomato, green onion, ladysthumb, cilantro, and culantro. You can use MSG if you like. Cook for a few minutes until the herbs are wilted and the tomatoes are soft. Pour the sauce over the fish and serve hot. 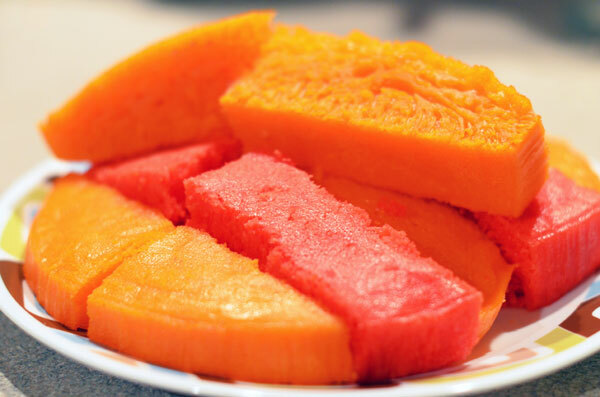 This is a delicious Vietnamese dessert called steamed rice cakes also known as banh bo. 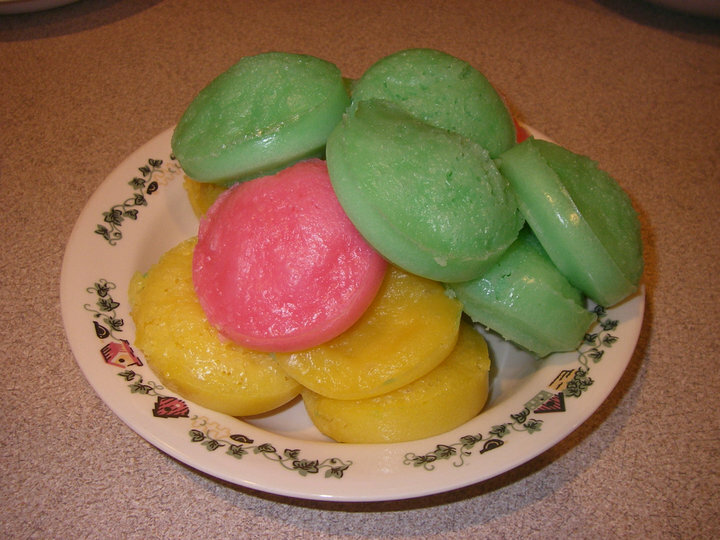 When I was little, my grandma used to make this for me (minus the coconut milk). There is a chinese version to this cake that doesn't use coconut milk. 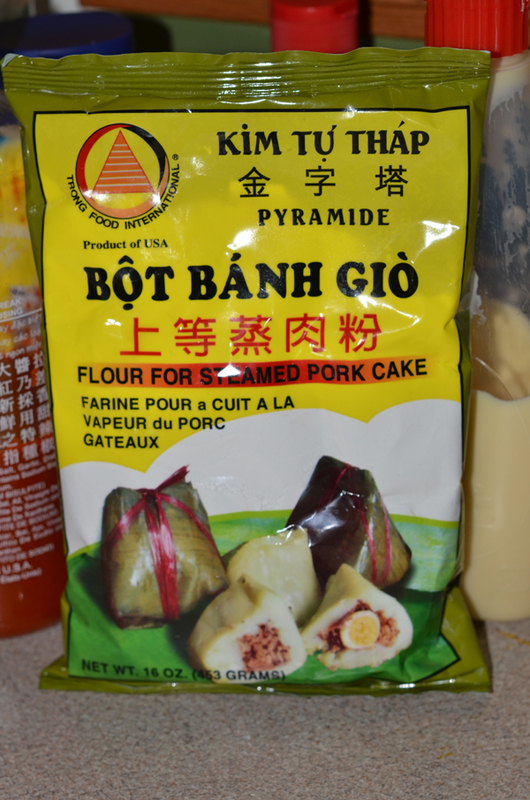 In hmong we call this "ncuav sawv". Many years ago when I tried to learn how to make this dessert, I failed miserably 13 times. On my 14th attempt, I finally got the beautiful honeycombs in my steamed rice cake. Oh boy, what a journey that was! The key to this recipe is PATIENCE!!!! Do not rush anything otherwise, you'll end up with a flat and unflattering cake. I also found that the secret to nice honeycombs is also in the preparation of the first step. It is critical that you have a good solid container. If you use instant yeast, you only need to allow the batter to rise for about 1 hour, then add the coconut/water/sugar mixture and let rest 20 minutes and then you can steam it. No need to wait 5-10 hours. Add 2 cups warm water, yeast, and 1 tbsp sugar to an ice cream bucket. Mix. Add rice flour and mix. Close lid, set aside for 5 - 10 hours (or overnight). The batter will rise and fall. The longer you keep it in the container, the stronger the flavor. In a small pot, add 1 cup water, coconut milk, and the sugar. Heat on medium until sugar is dissolved. Do not boil. Set aside for 10-15 minutes until cool. Using a whisk, stir the batter to loosen it from the ice cream bucket. Add the syrup from step 2 to the batter. Mix. It will become the consistency like milk. 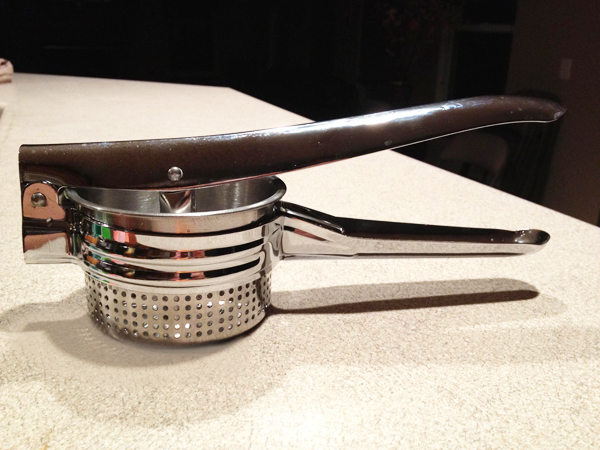 Open lid and you will see tiny air bubbles form. If you want to make multiple colors, separate the mixture into equal parts. 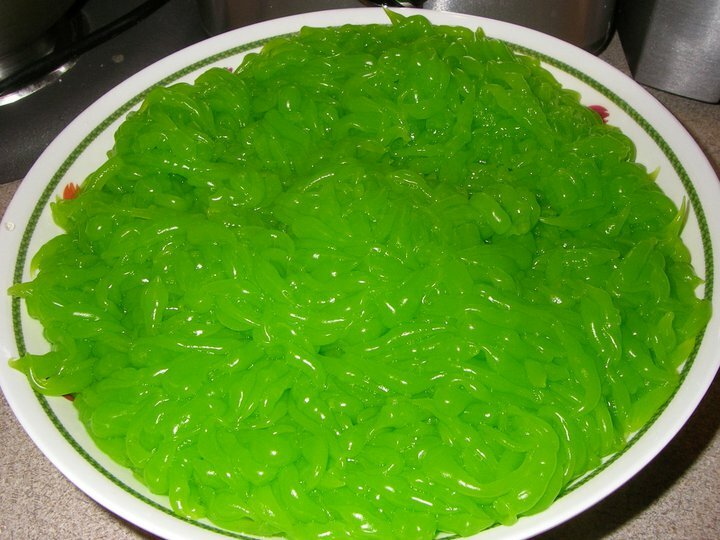 Add food coloring of your choice. Skip this step if you don't want color. Heat a steamer to boiling and place a metal pie pan. Make sure the metal pie pan is hot before you pour in the mixture. Steam on high for about 15-20 minutes. When the rice cake is done, the top surface should be solid. Remove from steamer and place into a freezer for about 10-15 minutes until cool. 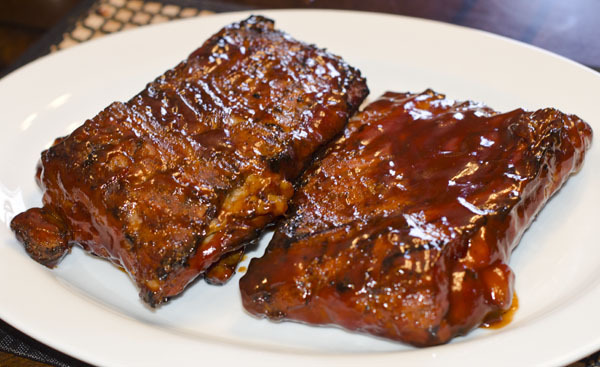 I hope you try this recipe and let me know how it turns out for you! Cut up the bottom of soda cans and use as a mold. It has a unique shape! I love Orange Julius. 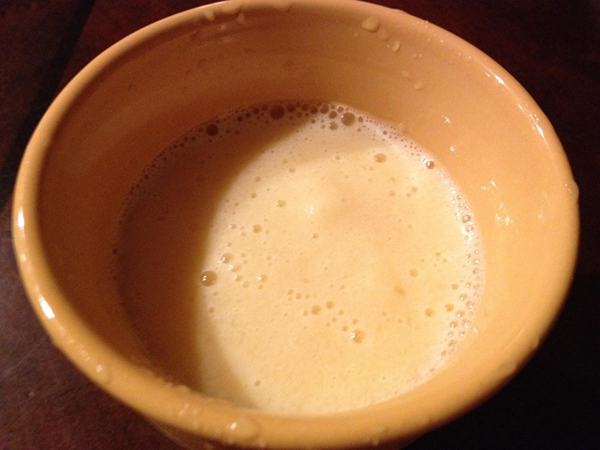 So here's a wannabe Orange Julius drink recipe I made that tastes pretty good. Give it a try! Put everything in a blender except the ice. Blend until smooth. Add in the ice. If your blender doesn't fit or is too full, you may have to blend it twice in separate batches.